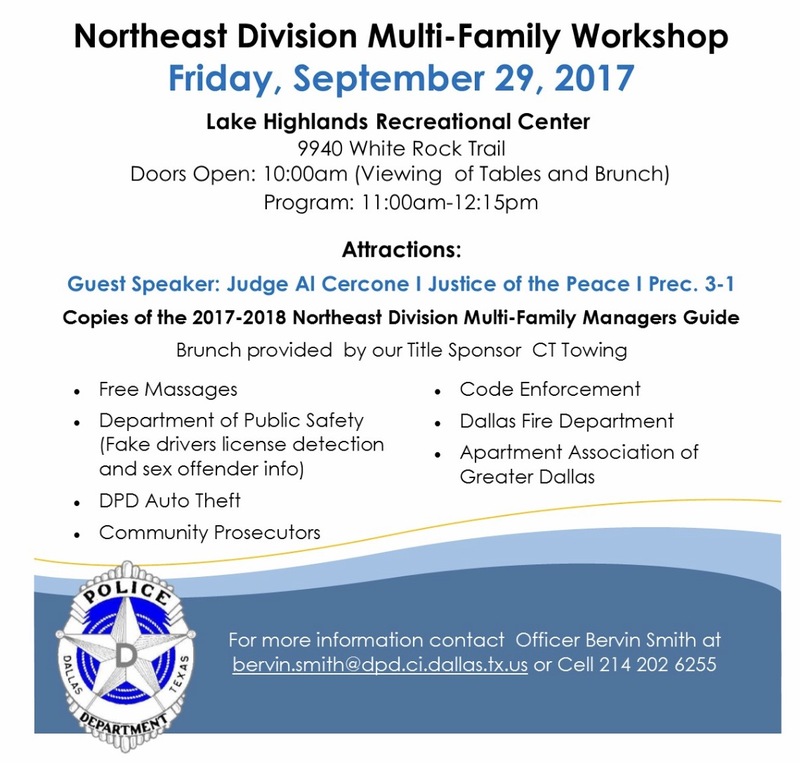 On September 29, 2017, the Northeast NPO Unit hosted a Multi-Family Workshop at the Lake Highlands Recreational Center. Local apartment owners and managers were invited to attend this event to provide them with pertinent information for the 2017-2018 Managers Guide. Various units from the Dallas Police Department were at the workshop to provide the attendees with important information regarding auto theft safety tips, gang related activities, and community affairs events. Members from the Dallas Fire Department, Code Enforcement, and the Department of Public Safety were also present. All the organizations were available for questions and for the managers to express their concerns. Brunch was provided for the attendees to give them an opportunity to mingle with one another. During brunch, Major Avery Moore and Officer Bervin Smith thanked everyone for attending the workshop and gave them an opportunity to win gifts through a raffle drawing. The workshop came to an end after a guest appearance and speech by the honorable Judge Al Cercone. Thank you to everyone who came out to participate in this event! Thank you Judge Cercone for taking the time to meet with our local apartment managers and thank you to the Apartment Association of Greater Dallas for providing us with such great apartment managers!